Breakfast is the first meal of the day which is in fact the most important eating occasion for a person that gives immense energy to him for the rest of the day and fill his stomach. There are mainly 3 types of breakfast service provided round the world in different hotels and restaurants which are English Breakfast, Continental Breakfast and American Breakfast. Many travelers don’t really understand “what is a continental breakfast” or “why is it called continental breakfast”. We hope after reading this amazing guide, you will have no confusion about continental breakfast service, served by hotel, motel, cruise ship or restaurant. The simplest meaning of Continental Breakfast is that it is a simple mini morning meal. In broader way, continental breakfast definition can be given in this way, a very light institutional meal plan which is typically consists of a light food selection like bread items, hot beverage items like tea or coffee, rolls, fruit, butter, jam and egg served in hotel, motel or restaurant. Continental breakfast is so much popular in hospitality industry that’s why often few people refer it as “Hotel Breakfast”. Generally in large hotels, continental breakfast is served in the form of buffet style food and beverage service which means continental breakfast is a self-service where foods are displayed on the table and guests can pick their desire food from the table rather being served by restaurant waiters (Read this guide: Job description of a restaurant waiter) or room service waiters (must read this guide: How to provide room service in hotel). If you have interest on history then you may wonder what is the origin of the term continental breakfast, right. According to our research, the term continental breakfast got popularity in France first from way back 1155. It was then called “Petit déjeuner” which means “To have light breakfast”. This was the origin part. Then, during the later phase of 19th century, the idea behind continental breakfast is started getting immense popularity in America. Then North American hotel authorities were trying to get middle class Americans who have different professions like accountant or businessman or dentist and they didn’t need heavy traditional American breakfast. At the same time European travelers were travelling in America and their light breakfast having habit (they preferred to have heavy meal during lunch) which consisted of hot beverages, pastries and few fruit items appeals general Americans as well as hotel authorities. Since the demands of flexible budget friendly hotel services was growing, hotel owners got the idea of serving breakfast as free which means guests could enjoy no other meal but breakfast along with room tariff with no extra expense. In this way, hotel owners were adopting the idea behind continental breakfast and thus it become the most popular breakfast type served in all over the world in hotel or motel or restaurants. There are Different Types of menu. Menu of a continental breakfast will vary from hotel to hotel. More or less here are few food items that are generally served by the name of continental breakfast. Here is a sample of a perfect continental breakfast menu. Bread Items: Bread items are very much common in continental breakfast. White bread or brown bread toast in sliced format, English muffins, donuts, croissants or Danish pastry served with or without topping like jam, butter, jelly, honey and marmalade. Beverages: There must be at least of one beverage items served in continental breakfast. Hot beverages are most common such as tea or coffee or hot chocolate. Milk is also presented sometimes. There must be fruit juice like Mango, orange, pineapple or grapefruit juice. In large hotels most of the items are served or displayed and in mid-range to low budget hotel there may be 2 or 3 beverage items to choose. Fresh Fruits: Besides juice, there may be fresh fruits like bananas, apple, orange, grapefruits etc. Some hotel authorities prefer to serve fruit as fruit cocktail where some serve as whole. Few countries of Europe, for example, the Netherlands and those in Scandinavia prefers to have fruits in continental breakfast. Miscellaneous Food Items: There are few items which are quite rare and you may only find in some places. Portion items like Boiled eggs and yogurt are quite rare in continental breakfast. Hot or cold cereal, sliced cheese and meats like ham, cereal are few other food items that may be included in continental breakfast in few hotel, motel or restaurant. Continental breakfast is provided in the lobby area of a hotel, motel or cruise ship or a large hall room near the lobby. It is normally served for 2-4 hours in the morning. As mentioned earlier, buffet style food and beverage service (Also read different types or classification of buffet style service) is followed to serve continental breakfast so foods are generally displayed on a large table or counter and also necessary amenities like forks, spoons, knives and plates are put aside. In some hotels, special food coupon is given to guests that they need to show while entering the room. There are tables and chairs for guests where they can sit or even if they prefer they can take the food to their room. 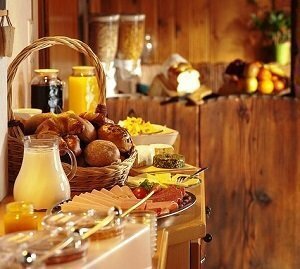 The concept of continental breakfast is highly popular in hotel industry. As we discussed earlier, the concept was adopted to attract busy mid-range travelers. Also from hotel’s point of view, these food items don’t cost them much but inclusion of “Free Continental Breakfast’ in their brochure really appeal guests to rent their room. Hotel authorities don’t need to pay much attention and manpower and it is very easy to manage since waiters need to carry few trays of bread items, juice and fruits. 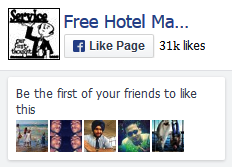 In many hotel’s brochure or web site there is a term mentioned as “complimentary breakfast” which means Free to avail. Here Continental breakfast is the style of that complimentary breakfast. Nowadays most mid to luxury hotels prefer the model of serving breakfast as free of charge. Since the model got immense popularity all over the world so it has become the standard in hotel industry. In most hotels, the continental or complimentary breakfast will be served only for few hours. As a guest you should try to visit the allocated area during the time. It is very common that some items may not be available anymore if you come close to the available time. So if you have time just go early. If buffet style service is offered you should not take large portions and waste most of it. This is sign of a very poor etiquette. The basic idea of continental breakfast is to have light meal. Even though, if you want to avail heavy meal no one will forbid you but you may get sleepy and tired after having heavy meal. So don’t eat extra. If you find anything not OK then politely report to the head waiter or restaurant manager. Your complaint will eventually help the authorities to provide better service. That’s all for today. In our upcoming tutorial we will discuss about other breakfast types like English breakfast or American Breakfast. If you still have any confusion please don’t hesitate to email us.